When a coworker asked me a few months ago if I was going to see Thor when it opened, I sort of shrugged, thought about it, and realized I didn’t really give much of a damn about any superhero movies coming out until next summer, when Christopher Nolan’s The Dark Knight Rises and Joss Whedon’s The Avengers open; the former holds significant interest because The Dark Knight (2008) is probably the best superhero movie that will ever be made (prove me wrong, Nolan), and the latter only because of Whedon, whose television series Firefly (2002) and its subsequent cinematic follow-up, Serenity (2005), are among the best science fiction works since Ridley Scott’s Blade Runner (1982). Seriously, I am no snob – under the right circumstances, I will watch literally anything that has ever been filmed – but I don’t really feel the need to seek out yet another remake, sequel, or superhero movie every time one is released. On the other hand, there are big summer adventure films like J.J. Abrams’s Super 8, a movie I knew I would have to see on the big screen (even if it meant paying for it) ever since that first tantalizing teaser trailer appeared on screens across America. In this case, it wasn’t so much Abrams’s pedigree that did it for me; I have yet to see a single episode of Lost, partly because I’ve heard it’s like crack and I’m not quite ready for another television addiction at the moment, and I was among the apparently few people who met his Star Trek (2009) with a bit of a shrug. It was entertaining enough, but I don’t see why people’s heads were exploding over it. 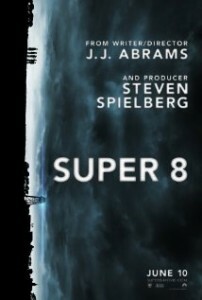 On the other hand, Abrams produced Cloverfield (2008), which I consider to be the best monster movie of the past decade, and from that teaser and the bit of buzz I was hearing about Super 8 before its release, it seemed like this would be very much in the spirit of that awesome and highly underrated film. So, yes, I was willing to pay for it. This ridiculously lengthy prelude has a point, I promise, and that point is this: I had become spoiled by arthouse crowds. Prior to seeing Super 8 recently, I had gotten comfortable with small, quiet crowds full of people who knew what they were seeing in advance and actually cared about seeing it, as opposed to just getting out of the house and stumbling into an air-conditioned room in which they could stare at something big and colorful while shoving some sort of corn syrup down their throats. Okay, so maybe I am a bit of a snob. At any rate, annoying as these mainstream crowds often are (and this wasn’t exactly an exception to that rule), it turned out to be the perfect way to see Super 8, a love letter to that blissfully entertaining but often disposable beast commonly known as the popcorn movie. My return to mainstream moviegoing began with the beautiful opening shot, a slow tilt down from a sign in a factory giving the number of days since the last accident. The numbers are being taken down, of course, and some idiot near me in the audience felt the need to stage-whisper “Zero.” Somehow, his idiot companion failed to hear his wildly unnecessary commentary so, to my increasing rage, he whispered again, “It’s going to say ‘zero’.” When a factory worker finally replaced the previous three-digit number with a one instead, I felt a bit elated that Mister One-Step-Ahead-Of-The-Movie was wrong, and I didn’t hear him chime in again for the rest of its running time; with a little luck, he went home and killed himself out of shame. Enough audience-bashing, you say? How was the movie, you demand to know? Very well; I’ll tell you: it was a lot of fun. 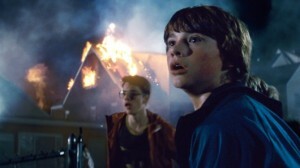 The story concerns young Joe Lamb (Joel Courtney), the boy who lost his mother in the factory accident alluded to above. This is a wonderful example of economical, visual storytelling, by the way – we see the accident sign, then cut to a very brief funeral scene, and we get the gist of Joe’s loss without a lot of dumb exposition. Joe’s friend Charles (Riley Griffiths) is a film buff out to make his own movies, along with Cary (Ryan Lee), Martin (Gabriel Basso), and Preston (Zach Mills). Each kid has his own defining characteristics: Charles is the director, of course, and a suitable surrogate for Abrams, producer Steven Spielberg, and any other dreamer who’s ever wanted to make their own movies; Cary is the pyromaniac, the kid in love with fireworks and explosions; Martin is the weak-stomached wimpy kid, who pukes at least twice in the course of the film (every group needs one). Preston is the least memorable, since he shares a sort of average kid vibe with Joe, but this is made up for by the presence of Alice Dainard (Elle Fanning), Joe’s adolescent love interest and the strongest performance out of an unusually adept group of child actors. The great Howard Hawks famously said that the criteria for a good movie is “Three great scenes, no bad ones.” Super 8 contains no truly bad scenes and at least two great ones. The first is the incredible, over-the-top train crash that Charles’s Super 8-millimeter camera inadvertently captures on film; the second is a “throwaway gag” during the end credits that really transcends that label by being the best part of the whole movie, and which I refuse to spoil in any way. Along with the train crash, Charles’s camera also captures blurry, indistinct footage of a strange creature that becomes the focal point of much of the film’s subsequent action, and gives it its connection to Cloverfield, as well as the Spielberg popcorn movies to which it has been rightly compared. As Spielberg did in Jaws (1975), Abrams wisely keeps his monster almost completely hidden until the end, most memorably in a sequence taking place in and around a convenience store that just might qualify as the film’s third great scene. When the monster is finally revealed, it is almost a disappointment, though it is rendered with the finest CGI the film’s ample budget could muster. Part of this is that, in keeping with Spielbergian tradition, the alien is a mostly sympathetic creature, despite the fact that it totally eats people, and because of its empathetic qualities it is far less terrifying than the crazy, awesome Lovecraftian monstrosity at the center of the superior Cloverfield. However, I can’t help but admire the balls of a movie that gives us a sympathetic creature that, in our first decent glimpse of it, is apparently gnawing on a leg of person (I have heard some viewers express a feeling of ambiguity about this moment, but I certainly like to think that’s what I was seeing). At the end of the film, before the previously mentioned, super-sweet credits sequence, some jackass in my audience loudly opined, “Well, that sucked.” He was wrong, dear reader, and I can only hope he was a part of the murder-suicide that also claimed the life of Mister “It’s Going To Say ‘Zero’.” For the rest of us, Super 8 is a damn good summer movie, and well worth the price of a ticket.